Students will practice writing addition and multiplication number sentences. Students will convert addition number sentences into multiplication number sentences. 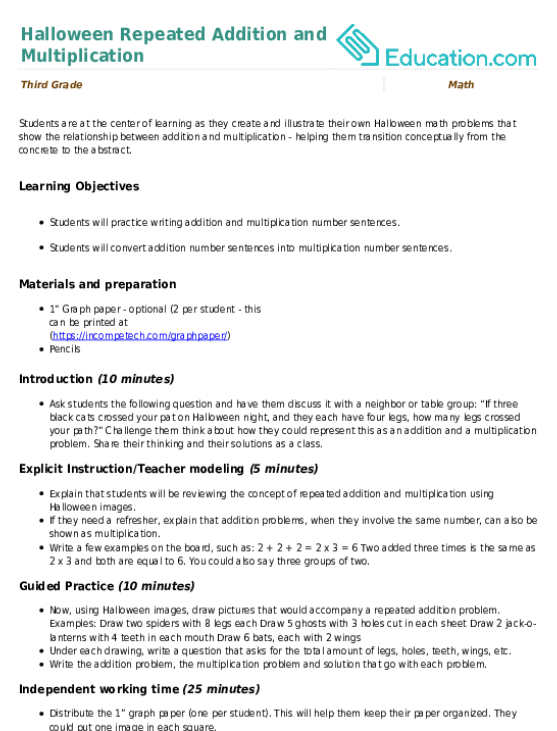 Ask students the following question and have them discuss it with a neighbor or table group: “If three black cats crossed your pat on Halloween night, and they each have four legs, how many legs crossed your path?” Challenge them think about how they could represent this as an addition and a multiplication problem. Share their thinking and their solutions as a class. Explain that students will be reviewing the concept of repeated addition and multiplication using Halloween images. If they need a refresher, explain that addition problems, when they involve the same number, can also be shown as multiplication. Write a few examples on the board, such as: 2 + 2 + 2 = 2 x 3 = 6 Two added three times is the same as 2 x 3 and both are equal to 6. You could also say three groups of two. Under each drawing, write a question that asks for the total amount of legs, holes, teeth, wings, etc. 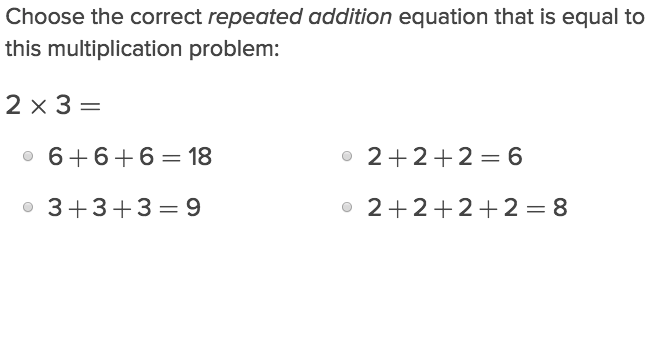 Write the addition problem, the multiplication problem and solution that go with each problem. Distribute the 1” graph paper (one per student). This will help them keep their paper organized. They could put one image in each square. Instruct students to create three examples just as you modeled on the board including all 5 parts: picture, question, addition sentence, multiplication sentence. Put Halloween music on while students work independently. NOTE: Since some students might want to invest more time in the drawing than the math, you could tell divide the amount of time they have to work by three and help them pace their work to be completed by the end of Independent Work Time. Clearly label an example as you expect them to do it on the board, numbering each step 1-5. While students are working, or at the end, check to ensure that each student represents the image with the correct addition and multiplication problems. Have students share one of their problems with the class or in a small group. This colorful worksheet provides a fun way to practice repeated addition. Get practice in the foundational skill of repeated addition by using it to find the total number of objects in equal groups. Celebrate golf at the 2016 Summer Olympics with this golf-themed repeated addition worksheet. Multiplication mummies and monsters, stay sharp this Halloween with a times tables practice sheet. 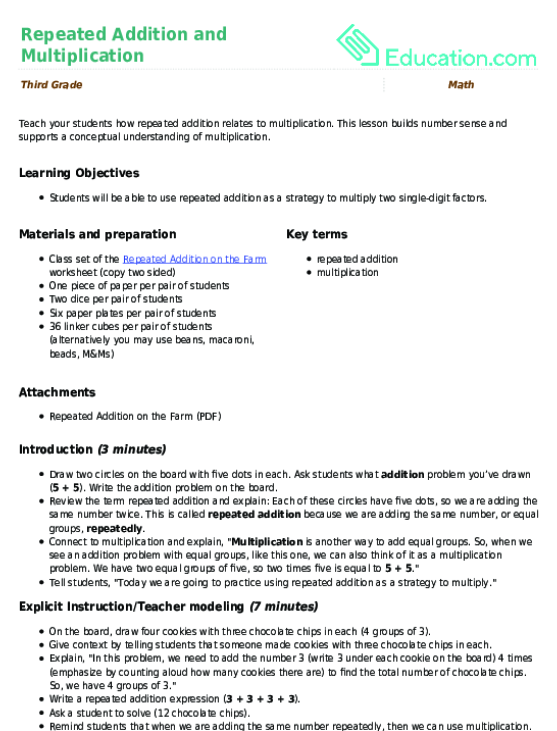 Math monsters, stay sharp this Halloween with a multiplication practice sheet. This is a great way to practice for a quiz and start memorizing times tables!